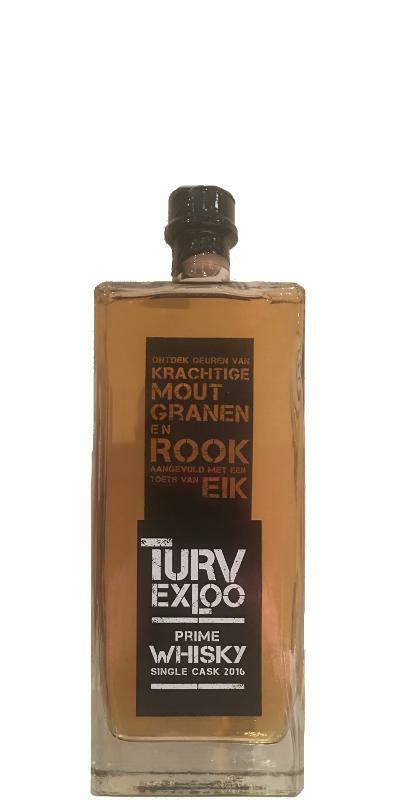 The Turv Distillery was founded in Exloo, Holland, in 2015. Matthieu Smakman invested 1.8 million euro and makes, according to him, different distillates through a very innovative and unique process. He created gin, Geneva, rum, vodka and whisky. Well, not exactly whisky, for the Turv Exloo Prime Whisky Single Cask 2016 is actually a spirit that matured for only 3 months. That is why he had to remove the word whisky from his label from the authorities. Smakman went on national television to comment on what he felt was a deplorable demand. He furthermore stated that the industry clearly sees him as a threat because he succeeded in making whisky in three months’ time that is equally good or even better (again his words, not mine!) than his Scotch counterparts that do mature for the required 3 years. What a bold statement. I had no other choice that to try it. The nose is very rough on grain, spirit, glue and resin. It even reminds me a bit of unwashed sports socks and… cooked ham gone sour. Immature and without any depth whatsoever. This is very unpleasant, in fact. But it becomes even worse on the palate! In comparison, the nose was okay-ish, so to speak. Again resin and some grain, a hint of lime, but apart from that all rough and spirit. You would be forgiven for calling this undrinkable. In all honesty, this is simply disgusting. The finish is mercifully short on glue and sugar. I have long debated whether or not to publish this, for in the night of 30 March, the Turv Exloo Distillery was hit by disaster. The distillery burnt to the ground and the fire brigade found that it was in fact arson. The body of the 53 year old owner was found in the rubble the day after. A desperate act? This is not something you wish upon anyone. I wish the family a lot of strength in these trying times. Nice round, pleasant. Beautiful development, soft. Nice sweet, bourbon influences. Misses somewhat development and complexity. Blood little bit dead. Let me think of a kind of blend. Think it is 2nd or 3rd refill. Totally not smoky, by the way, we can not recognize any form of peat or smoke. Taste also unfortunately did not develop later, should have had more time on the barrel. Wood influence is also low. Despite that he tastes surprisingly mature, lacking the sharpness that is present on the nose. Unfortunately. Please note that if you see a photo on which the word "whisky" is mentioned, this is an old picture. TURV has been commanded by the Dutch competent authorities to remove the word whisky from its label. This pretty undrinkable spirit shouldn't be on Whiskybase. The nose is the less worst part, I would go one step further than Thijs100 and would advise any whisky enthusiasts to skip this one. So no first dram at all. Some people say you have try everything in life. They are wrong. I know it's a spirit, but the producer clearly wants it to be judged as a whisky. Whichever way you judge this, I have a hard time believing any whisky enthusiast will pour himself a second dram. A tad sour-ish (pickled lemon peel). Not unpleasant, but different. Grainy and flowery. No depth or layers. Glue, which is a common aroma (in whisky), but not necessarily a common flavour. Some strange off-notes. It is off-putting. Slightly phenolic. Grassy. White pepper. Really short. A hint of oak, spices. But the off-notes also make an encore. Luckily not for too long. It's not a whisky to start with, despite the fact that it was marketed in this way. It comes closer to a grain than to a single malt. The exact ingredients are kept secret by the staff, even during tours. Anyhow, this is a rather characterless spirit, without a signature feature. Of course we can wait until it can be officially called "whisky", but I suspect it needs much longer time to make this spirit enjoyable. 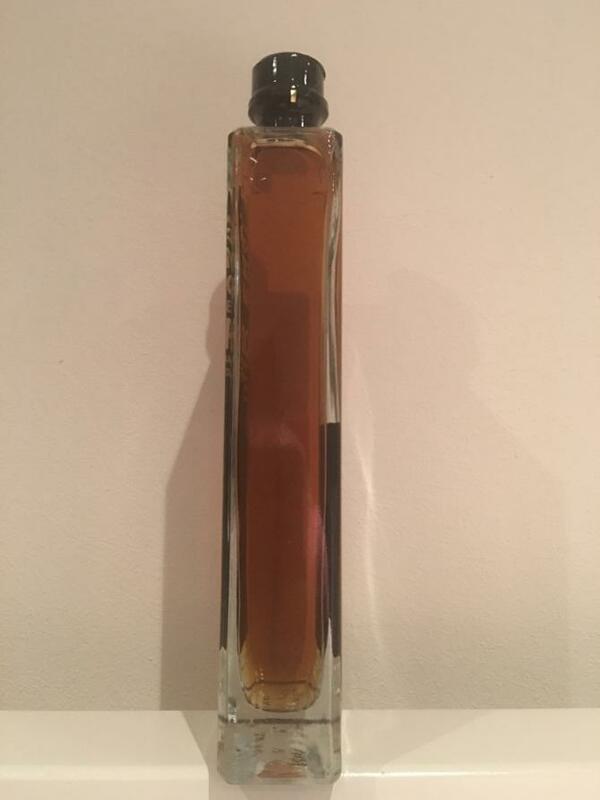 Old gold for a 3 month old spirit? That's remarkable. The nose is rather on grain spirit: glue, sweat socks. It's raw and unpolished. This changes quickly, but to a very neutral and characterless spirit. There may actually be peat in there, yet it's masked by a dominant smell of alcohol (this baby was distilled to almost 95% ABV...). This alcoholic smell lingers, along with some grainy notes and vanilla essence. It smells rather spirity and artificial. Glue, maize, pine sap, sugar, vanilla, but still this alcoholic feel. Comes across as a grain whisky. This can be due to the distillation method to ca. 94% ABV. Glue and sugar continue in the finish, with some pepper. 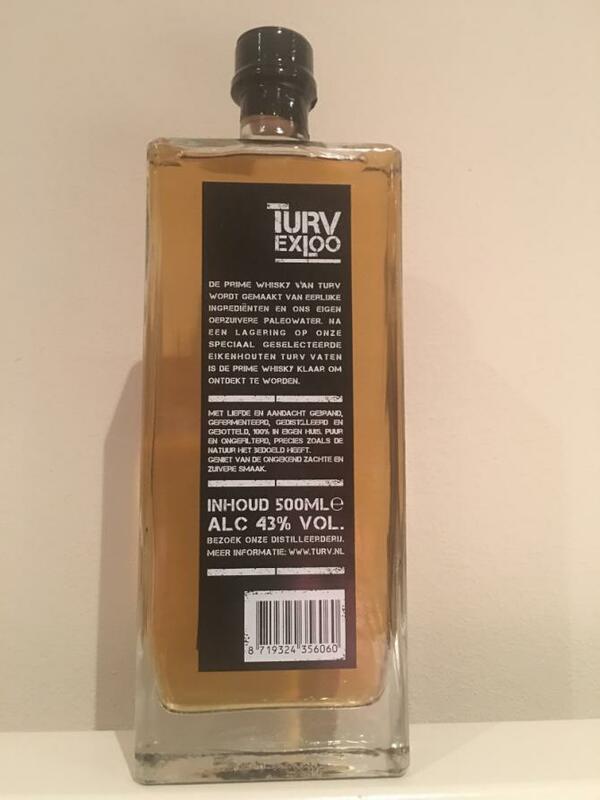 The Turv Exloo Prime Whiskey Single Cask 2016 is a 3 month old distillery from the Turv distillery in Exloo.